The author has specialized in Scandinavian history during the period when the Vikings burst out onto Europe and beyond. His knowledge of warfare and tactics of the time is impressive and this book takes a fresh approach to the period, considering both the Vikings and their enemies. This is probably the finest account of warfare during the period and is essential reading for anyone who wishes to understand this extraordinary period. There is a compact by useful photo-plate section and the writing style is descriptive and easy to follow. SUBJECT: Vikings, Middle Ages, Medieval Period, Global Warming, warriors, weapons, ships, longships, knarr, raiding, invasion, Danegeld, society, Scandinavia, Europe, North America, South America, Africa, spice route, North East Passage, sunwheel, sun stone, compass. DESCRIPTION: The author has specialized in Scandinavian history during the period when the Vikings burst out onto Europe and beyond. 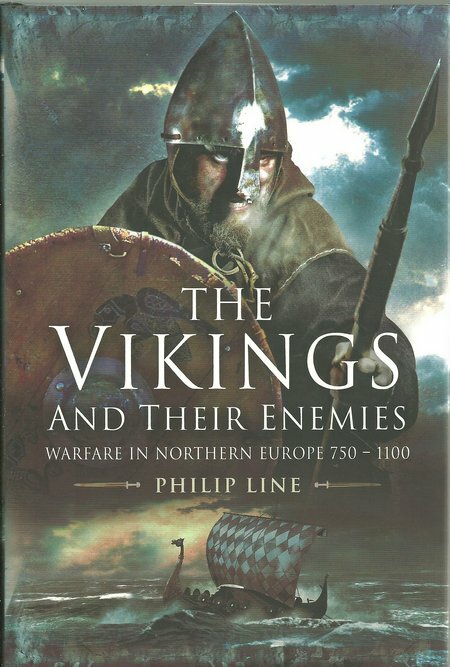 His knowledge of warfare and tactics of the time is impressive and this book takes a fresh approach to the period, considering both the Vikings and their enemies. This is probably the finest account of warfare during the period and is essential reading for anyone who wishes to understand this extraordinary period. There is a compact by useful photo-plate section and the writing style is descriptive and easy to follow. During the last sixty years, historians have come to reconsider the established wisdom and the picture of Vikings, as a bunch of blood-stained bandits, devoid of culture and inferior to those they attacked, has begun to change. In technology, the Vikings produced a longship that was an outstanding vessel, able to sail over long distances and through challenging marine conditions. The hull was flexible and able to cope with heavy seas. It was an open boat, but in bad weather canvas was used to provide some protection. The large square sail did not require a large crew to control it and the use of oars enabled a good speed when there was no favourable wind. The Vikings also used a number of new navigation aids. We do understand the sun wheel and replica longships have navigated, using this effective tool. The compass is also understood, although the Vikings did not use a glass enclosed and gimbled compass card. One common method was to float a straw, containing magnetic ore, in a bucket, an alternative being to suspend magnetic metal from twine. The result was however just as effective as a modern compass with little iron work to cause deviation. What we do not understand is the sunstone which is referred to in sagas. It is claimed that it could see through fog and cloud to the sun, but how it worked is a mystery. The Vikings built a range of vessels to a broadly similar design. Even very small coastal and estuary craft looked very similar to the fighting longship. Following the same basic method of construction. The knarr could be regarded as a trading vessel, but was also used in war and for very long passages. It tended to have a broader beam relative to its length than a fighting longship. It was also more likely to include covered space and some accounts suggest a full deck was not uncommon, particularly in vessels regularly used further north. The fighting longship included shield rails that allowed shields to be positioned along the sides, giving further protection to the crew, but ready to hand when the crew were defending their vessel or going ashore to fight. Exactly why the Vikings suddenly stormed out from their native lands in waves of expansion may long be debated. There have been speculations that the population had expanded beyond the capacity of their native lands. There have also been those who suggest the Vikings found plunder easier than farming. However, there is also evidence that Vikings were traders who preferred to trade but were prepared to fight, and who were inquisitive explorers who sailed across oceans. The Vikings were armed in a very similar manner to their neighbours, but there is also growing evidence that they took on military technology that they discovered in their extensive travels. Our basic problem is that the Vikings depended heavily on an oral history, sagas told around the hearth in the long winter nights. Many of these sagas have survived and archaeology has begun to support details from surviving sagas that were previously discounted by historians. These sagas were intended for education and entertainment publicly, but there were also family sagas that were intended for the future leaders of family groups. Sir Walter Scott made use of some family sagas he learned from the Galwegian families of south west Scotland and Icelanders have also preserved many of their family sagas. Against that, the Vikings’ neighbours maintained written histories, usually written by priests and frequently heavily biased. Historians have tended to believe written accounts, even though there is no real evidence that they are in any way superior to verbal histories or any less partial. The author has done a very good job of presenting his interpretation of Viking history and their interaction with their neighbours. This is fascinating reading and informative. There is still much to discover about the Vikings, their society, their methods of warfare and their approach to laws and civil structure, but this book provides a very balanced view, based on what has been learned to date.